Our Daily Deal today is a must for any bath diva on the go. High quality and classic white, our bath cap is the perfect bathroom accessory when you don't have time to wash your hair. 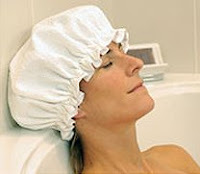 Keep hair dry while bathing with this stylish shower hat from Australia. 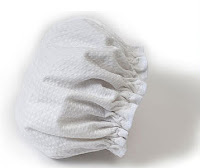 The sturdy waterproof liner is covered with a cotton/satin/polyester outer in a classic white waffle design. Time for the plastic caps from hotels and dye boxes to hit the bin! One size fits all.